Welcome to the Hilton Templepatrick Hotel & Country Club. Bring the family to this centrally located hotel and country club in Templepatrick, presenting 220 acres of beautiful wooded parkland within the Castle Upton Estate, just 10 minutes from Belfast International Airport. 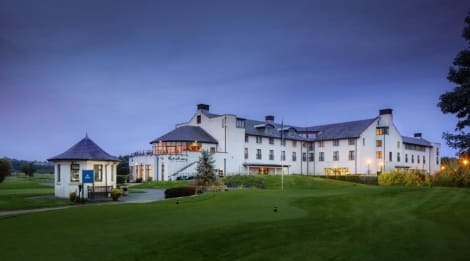 Recently awarded ‘Northern Ireland's Leading Business Hotel’, 2010 and 2011, and ‘Northern Ireland's Leading Golf Resort 2010’ at the World Travel Awards, this hotel offers impeccable service in a relaxed setting. Close to Templepatrick Village, yet only 20 minutes from Belfast city center, the Hilton Templepatrick hotel is the perfect base to explore Belfast and the Antrim coastline.Visit the Giant’s Causeway 40 miles away. Tee off at this charming Templepatrick hotel’s 18-hole championship golf course as well as our 16 bay floodlit driving range. Enjoy the two all-weather tennis courts, 18 meter indoor pool, and health club with gym, steam room, sauna, bubble spa, and beauty and hair salon. Kids will love ‘splash hour’ in the pool and junior golf lessons. Set in mature grounds with an attractive modern exterior, this golf resort near Belfast offers stylish rooms with separate working areas, garden or golf course views, and high-speed internet access. Stay connected in the business center or in the restaurant and bar which serves local and international cuisine.With 10 WiFi enabled meeting rooms for 2 to 500 guests, ballroom, conference and banqueting facilities, the Hilton Templepatrick is ideal for your special event. Host wedding services and receptions and enjoy unique packages catering to every need. lastminute.com has a fantastic range of hotels in Templepatrick, with everything from cheap hotels to luxurious five star accommodation available. We like to live up to our last minute name so remember you can book any one of our excellent Templepatrick hotels up until midnight and stay the same night.